Spending a summer traveling across Montana, stopping for two-week stints at six different ranches, may sound like a dream to some and possibly a bad reality television show to others. For two interns this past summer, it was our dream turned into reality. Abby on Nick the horse after a long day of riding and moving the cattle near Nye. I’m Abby Northrup and I spent this past summer as one of two Montana Rangeland Resource Committee interns with the state’s Department of Natural Resources and Conservation (DNRC). The experience blew this Montana native away. I gained extensive agricultural knowledge and skills, learned about Montana’s history, and witnessed incredible landscapes. But the most impressive part was the people and communities I met and worked for. Growing up in the suburbs of Helena, I didn’t have much opportunity to connect with the land and hadn’t spent more than two weeks in rural living. Becoming part of Montana’s rural communities gave me a good look at agriculture while gaining an understanding of the origin of the common Montana spirit: community and devotion—to one another and the land. 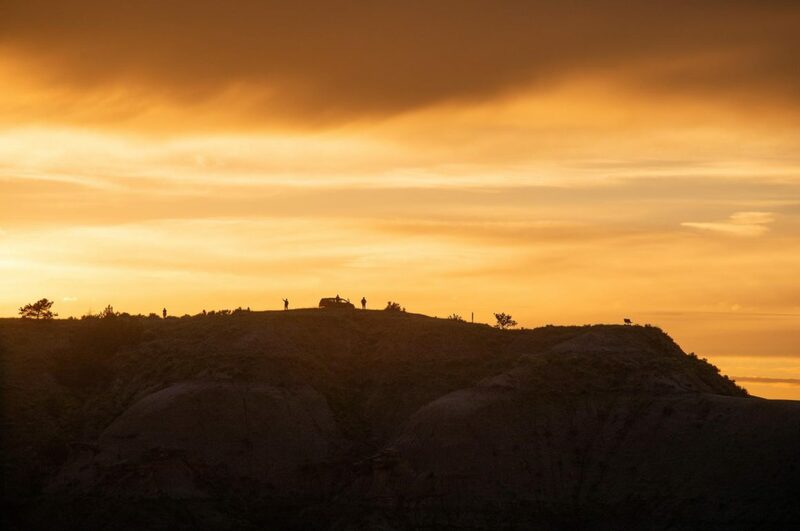 I explored landscapes that not only support ranchers’ livelihoods, but also serve as cherished memories of their past and a reminder of difficult as well as productive years. As I listened to their stories, I learned about the history of the land. There was the story of a buffalo jump site near Nye used by various Native American tribes, including the Crow and Shoshoni. Another story explained the scars of an old stagecoach road, once a major passageway for transporting money and other items across the Raynesford prairies. Other stories described how land use has shifted the landscape over time. Oil companies in the Sidney area, cropland conversion of a productive prairie near Winnett, and an influx of recreation across Montana have all left their mark. Ranching family historians often recorded these changes in record books, complete with photos and descriptions. Others preserved visuals of the past with paintings. In the airplane ready to go look at some sheep near Winnett. A very exhilarating ride! My internship is just one of the ways the ranchers I worked with help people learn about and connect with the land. They often invite friends, neighbors, and family members out to their ranches where they demonstrate activities like branding and hunting. 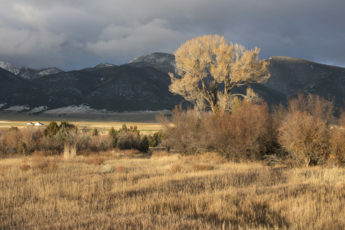 In every case, they work to create unique experiences that tie back to the Montana landscape. Abby releases some gallflys to control the Canadian thistle near Culbertson. In Gold Creek, I toured a productive landscape the rancher shares with the local elk population and learned about block management, a cooperative program between private landowners and Montana Fish, Wildlife, and Parks that helps landowners manage hunting activities while providing the public with free hunting access to private land. 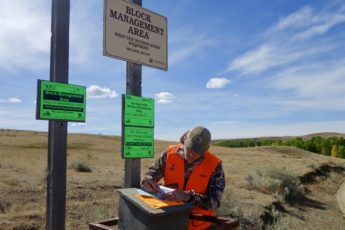 This partnership helps manage the elk numbers and also provides the community with an opportunity to take part in a Montana tradition. Promoting a strong relationship with neighbors is vital for the balance of Montana landowners and recreation enthusiasts. Understanding they hold the key to the land’s future, ranching communities care deeply about their land and work hard to ensure the land will be healthy and useable for decades to come. From participating in Conservation District meetings in Ronan and Columbus, to joining in Stillwater River weed pulling events, to coming together to install fences for new grazing practices in Raynesford, these communities are committed to improving the places they call home. My internship gave me a direct role in caring for these lands as well. Among my various tasks was learning a variety of ways to identify and take care of noxious weeds, including spraying, pulling, and biocontrol through insects. Abby stands next to a GPS-powered combine that harvested peas near Culbertson. In addition to valuing relationships with their neighbors, these ranchers prioritize a tight connection with their families and their fellow ranchers. For example, at the ranch in Raynesford, grandkids are an essential part of the operation. I worked side-by-side with several of them to push calves into chutes, move cattle on horseback, and fix and build fences. Through these experiences, I learned the behavior patterns of cattle while improving my horsemanship skills. We also worked together to irrigate, cut, and bail hay fields. In Winnett, I toured a multigenerational cattle and sheep ranch where each family member has a role to play in keeping things moving. Also near Winnett, I watched ranchers take on a mentoring-type role for young couples and families who are new to ranching. By leasing land to them and offering tips for making a living in the ranching business, they are introducing a new generation to this challenging lifestyle. My days on the ranches were often long and labor-intensive, but, at the end of each day, I was rewarded with good stories and even better meals. Participating in many of the activities that are common practice on the ranches gave me a much greater understanding of the ranching world. As I begin my junior year at Montana State University, I am looking forward to taking lessons learned from my Rangeland internship and applying them to my classes at the Land Resources and Environmental Science Department. This experience has energized my interest in agriculture and given me a new perspective on how I can help landowners and producers take care of their land and resources while providing for their families and communities. This internship not only gave me invaluable lessons about agriculture, it also taught me how to be a good neighbor and work collaboratively with those around me to promote a common good. Abigail Northrup grew up in Helena. She now attends Montana State University where she studies Land Resources and Environmental Science.